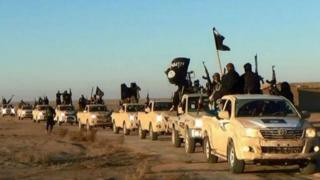 Islamic State: An invincible force? In June 2014, so-called Islamic State (IS) took over the Iraqi city of Mosul. Within weeks, the organisation had swept through large swathes in Iraq and Syria, seizing a territory the size of the United Kingdom. The territory IS controls has shrunk in the two years since a US-led multinational coalition launched an air campaign on its positions, first in Iraq and then Syria. The coalition has managed to push IS out of the Iraqi cities of Tikrit and Ramadi, as well as an ever-increasing stretch of Syrian-Turkish borderland. Enemies of the "caliphate", backed by (mostly) US fighter jets, are now bivouacked 50km (30 miles) from the IS "capital" of Raqqa, in northern Syria. Yet IS' hold on its most valuable strategic terrain, the areas seized either in or before 2014, is still uncontested. It is entrenched in Mosul and Raqqa and the Sunni Arab tribal heartland of the Euphrates river valley, which stretches from eastern Syria to western Iraq. While it has lost much of the northern Syrian borderland, IS has also expanded into areas hitherto resistant to it, such as the Damascus suburbs and parts of the Aleppo countryside. IS' military arsenal consists of Russian and American weaponry mostly seized from government and rebel forces in both Iraq and Syria. Its stockpiles include a fleet of Humvees seized after it defeated the US-equipped Iraqi army in Mosul and elsewhere. The group's ability to acquire war spoils in the form of Russian and American tanks, recoilless rifles, rocket-launchers, light arms and ammunition was seriously diminished after it became harder to swiftly seize new territory. When the campaign started in 2014, the US Central Intelligence Agency (CIA) said IS could muster between 20,000 and 31,500 fighters, up from an initial estimate of 10,000. Despite over a year of air strikes, in February this year the White House said IS still had up to an estimated 25,000 fighters, mainly foreigners, from more than 90 countries. Despite its fearsome reputation and initial shock grab of territory, IS is not invincible on the battlefield. The bulk of its rank-and-file infantry, particularly foreign, do not fight well and are often dispatched by their native commanders as cannon fodder. IS' most capable soldiers, its "special forces", have typically been Iraqi and Syrian militants with long experience of fighting in those countries, and graduates of other insurgencies, notably the Libyan-heavy al-Battar Brigade or the various units of militants from Chechnya or elsewhere in the Caucasus. Where IS has excelled is in the realm of intelligence tradecraft. This includes the maintenance of a highly elaborate and multilingual propaganda machine that caters to all constituencies, from American Muslims to Iraqi tribesmen. Using bribery, blackmail and its own totalitarian form of cultural outreach, it has been able to win friends and influence people across thousands of square kilometres, often conquering a town, city or village long before its advancing columns lay siege to it. IS dispatches cash-strapped sleeper agents into the ranks of its opposition, such as the Iraqi Security Forces or the Free Syrian Army, to slowly, covertly, buy or build a constituency. IS is in many respects a project of Saddam Hussein's now-outlawed Baath Party, but with a different ideology. Former agents or officers of the former Iraqi president's regime dominate its leadership. For instance, Samir Abd Mohammed al-Khlifawi, better known as Hajji Bakr, was a colonel in Saddam's elite intelligence service of Saddam's Air Defence Force. He was responsible for building IS' infrastructure in northern Syria in 2012 before being killed by anti-Assad rebels. Another key IS figure was Abu Abdul Rahman al-Bilawi, a former captain in the Iraqi army. He was killed two days before the group's seizure of Mosul in June 2014, an operation whose final blitzkrieg he himself planned and so was accordingly dubbed "Bilawi Revenge". Bilawi hailed from Iraq's Dulaim tribe, the country's largest. He was also quite close to Abu Musab al-Zarqawi, the founder of a precursor to IS. A third ex-Baathist was Abu Ali al-Anbari, also once an intelligence officer in Saddam's army. Anbari is the mastermind of the group's espionage and clandestine services, heading the IS Security and Intelligence Council and so tasked with running a vast honeycomb network of spies, operatives and sleeper cells, including those now active in countries beyond Iraq and Syria. The ex-Baathists shape the group's jihadist ideology, handle its security (weeding out infiltrators or possible putschists) and military operations, and ensure its resilience. They represent a battle-hardened and state-educated core that would likely endure (as they have done through US occupation and a decade of war) even if the organisation's middle and lower cadres are decimated. Ex-Baathists have established an underground network, whose operatives are often disguised, even from other members. This network of sleeper cells and security-minded members represent the organisation's core and, even if IS is defeated or contained militarily, will make it difficult to vanquish all together. Hassan Hassan is an Associate Fellow at Chatham House, London, and a Resident Fellow at the Tahrir Institute for Middle East Policy, Washington; Michael Weiss is a senior editor at the Daily Beast.